Bykerk Landscaping » Is It Time for a Spring Soil Test? Last month we talked about doing spring lawn tasks that, if done now, will save you work later on in the year. Have you had time to get out there and rake yet? Most of the snow in West Michigan is already gone, and there have been some nice days that may have tempted you outdoors. If not, call us. We’d be happy to do the raking for you. Spring is also an excellent time to get your soil tested. 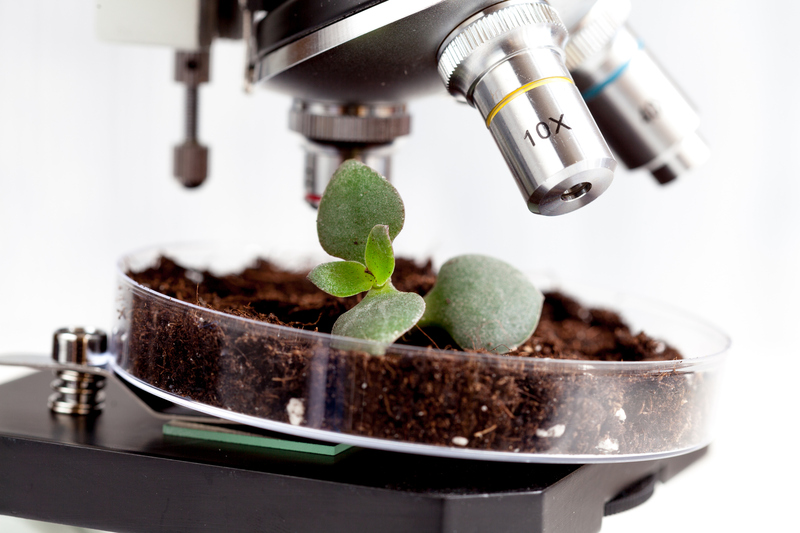 Soil testing will determine if your soil has nutrient deficiencies or issues with soil pH. If you’ve noticed that your lawn has a color, density, or rooting problem, getting a soil test is the first step to correcting any problems your lawn has. To understand why soil composition determines lawn quality and appearance, let’s talk about what soil is. The Glossary of Soil Science Terms gives us one definition: “The unconsolidated mineral or organic material on the immediate surface of the Earth that serves as a natural medium for the growth of land plants.” To state it in clearer terms, though, soil is the skin of the earth. It’s a mixture of minerals, water, air, organic matter, and organisms, both living and dead. Plants need soil to grow and live because they take the water and minerals they need for growth from the soil. If the soil does not have the right minerals or the right amounts of minerals, plants will not grow. Of course, different plants need different minerals in order to flourish. In your lawn that plant is grass. Grass needs at least 18 different nutrients or essential elements to grow. Of these nitrogen, phosphorus, potassium, calcium, magnesium, and sulfur are needed in relatively large amounts. Rain supplies sulfur, and calcium and magnesium can be added with lime. Most fertilizers supply nitrogen, potassium, and phosphorus, but dumping fertilizer on grass isn’t any help if you don’t know what your soil is missing. This is what soil tests determine. What Does a Soil Test Measure? A soil test will measure how acidic or alkaline the soil is. This is called the soil’s pH. It’s measured on a scale of 1 to 14, with 7 considered neutral. Neutral soil contains the correct amount of micronutrients like boron, copper, and iron too. If your soil tests below 7, it’s considered acidic, and above 7, it’s considered alkaline. Typically plants like a neutral soil between 6.2 and 7.2, although there are some plants, like azaleas, that love acidic soil. A soil test will tell you how far away from neutral your soil is and which elements are missing and must be added. From there you or your lawn maintenance service can add the proper amounts of nutrients and fertilizer. You do not want to add too little, or your lawn will not thrive. Adding too much means spending money on fertilizer that will wash away or even pollute your area. You may have wondered “Which landscaping companies are near me?” In West Michigan, Bykerk would love to be your lawn care service. If you’re in the Greater Grand Rapids area, we are available to test your soil and provide the nutrients and tending it needs to be green, soft, and lush this spring, summer, and fall.